Simplicity and functionality should be the guiding principles for designing a small office network setup that meets the needs of your growing company. Remember that networking hardware that fits right now may not keep pace two or three years out, and outgrowing your hardware before it reaches obsolescence is generally thought of as a waste of resources. Knowing the basics about networking hardware is the first step in planning for the appropriate purchase. Think of a small office network setup as having a foundation of switches and routers. Knowing the difference between the two sorts out a lot of the confusion SMB owners may have about choosing the right networking hardware. A switch is any piece of equipment that allows networked devices to communicate and share information. On an Ethernet network, you’re connecting desktop PCs, printers, servers, network attached storage (NAS), voice over IP (VoIP), surveillance systems—any device with an Ethernet cable port. Switches tie together these devices into a network. A router, by definition, ties together different networks both inside and beyond the physical space of an office network. In most cases for SMBs, this means tying your network to the Internet, the greatest network of them all. A router is “smarter” that a switch. It prioritizes the flow of information from the Internet to your networked devices, and protects your devices from cyber threats. Where it might get confusing is that nearly all wired routers by definition have a switch integrated into them. Furthermore, a wireless router also acts as an access point, as well as a switch, all at once. The nomenclature gets a little arcane if you do not have a formal IT background. If you want to dig into the naming conventions a bit deeper, you can read up on how to differentiate gateway, firewall, and router features. There are three basic types of network switches to choose from when setting up a small business network: managed switches, unmanaged switches, and smart switches. An unmanaged switchis the likely choice for most small business networks. It works out of the box and offers only basic configuration features. Unmanaged switches require minimal technical aptitude to install and operate. In short, they just work. A managed switchgives you more control over how your network consumes an Internet connection. Usually IT controls a managed switch using the command line interface (CLI), but newer managed switches do have a graphical interface to use. Managed switches can be adjusted remotely, ideal for large-scale or satellite office deployments. A managed switch generally requires some technical training to take full advantage of their feature set. Several manufactures market a smart switch, also called a Layer 2/3 switch. A smart switch is an in-between for unmanaged/managed switches. It’s ‘smarter’ than an unmanaged switch because it gives you control over Layer 2 of the open systems interconnection (OSI) model. However, if you need full-on Layer 3 controls for your small office network, opt for a managed switch. A firewall or security appliance is an essential router feature for any small business network. It is essentially software built in to a router that helps screen and filter incoming cyber attacks on your network. Unified Threat Management (UTM) devices have become a popular choice for small business networks for their robust feature set, relative ease of use and SMB-friendly price point. What is a UTM? Virtual Private Network (VPN) support is important if users need to access your office network from outside the office. If this feature is important to your small business network setup, learn more about setting up a VPN. Manufacturers in the past year or so have started releasing VPN routers especially for small offices. Here are some of the top-rated VPN wireless routers for small offices or home offices available in 2019. Wireless routers and wireless access points (WAPs) in a small business setting have become mainstream since the “bring your own device” (BYOD) mentality is now the norm in many work environments. Consider the size of your office space and make sure range of the wireless router is sufficient. Plotting out a Wi-Fi heat map can help with your purchasing decision. Small business Wi-Fi typically operates over the 802.11ac standard as it offers the best throughput, so look for a router that supports that standard. 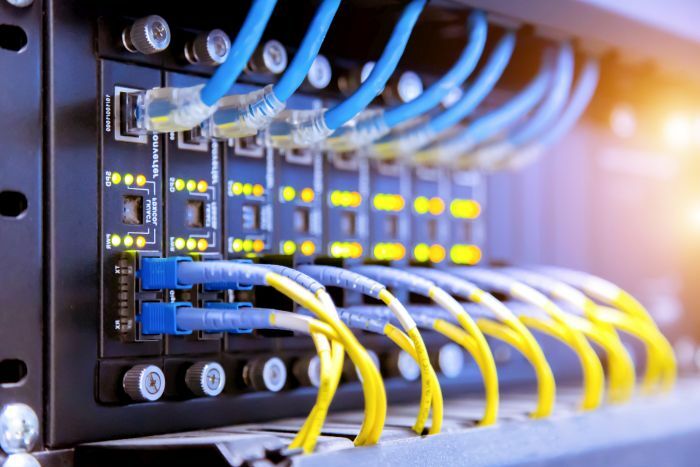 Modern small business networking equipment is conveniently powered over Ethernet (PoE) meaning that it powers up through the networking cable and needs not to be plugged into an electrical outlet. PoE makes planning and installing network equipment easier. If you’re considering placing new WAPs and surveillance equipment on your IP network, consider using the latest PoE+ standard which delivers more power over Cat 5e cabling. This supports newer equipment which draws more power. Scalability for your network should be understood by the number of Ethernet ports your switch(es) have. You want your open Ethernet ports to outnumber the endpoints desired on a small business network. The more Ethernet ports a switch supports makes the price higher, but choose your ports wisely. Make sure you plan ahead to the extent of your product life cycle. Having to buy a switch with more ports before the old one reaches end of life is a waste of resources. Performance is the other determinant for the price for network switches. The faster a switch can transfer data packets the more expensive it tends to be. If your operations involve involve transferring large files across a network, you will benefit from having a higher performance switch. If that’s not the case, you might opt for something a more baseline switch. Learn more about network switch cost-to-performance considerations. While these tips and best practices are a good starting point, understand that every small office is unique and there are no real one-size fits all solutions. It comes down to how well you can assess your needs and pair them with the networking hardware that is available within your budget. Taking that into consideration and remembering to scale for growth will allow you to make the most out of your small office network setup. Thanks For sharing. A really informative article. It will be very helpful to the newbies in this field. Informative article, we see a lot of small business owners who struggle with equipment selection due to the wide range of options out there. I can suggest trying MyChat. This program has own server, everything under your control. You can manage your remote users and collaborate without problems.